It's rewind Wednesday which means I'm pulling up a favorite to see if these Cheesy Turkey Meatloaf Bites are as good today as they were several years ago. I hadn't made them for about a year, so last week I whipped up a batch hoping to freeze a few. Nice try! Kenya, Chloe and their two friends, Frankie and Graham ate an entire batch in less than 15 minutes. It was fun watching them down the full recipe even though it left hubby and I eating leftovers. Next time I'm doubling to make sure I have plenty to go around! Meatloaf is THE all-American food. I always think of it as the dish that you either love or absolutely hate. I've also seen hundreds of recipes for it and people are extremely passionate about what they think does and doesn't belong inside. My mother must have used an entire bottle of ketchup on hers. I'll refrain from commenting. My version of meatloaf is perfect for the whole family, but especially for your little one. 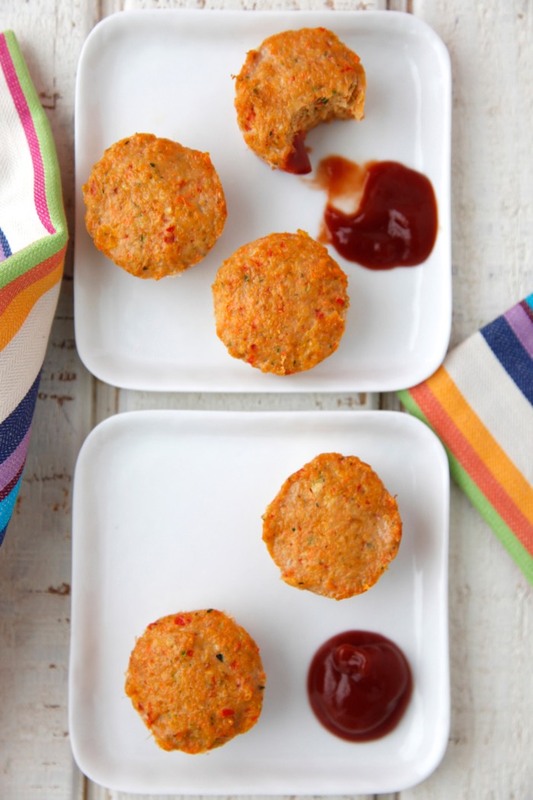 The best part is they're cooked in mini muffin pans, so they only take 20 minutes to bake. I pack mine with vegetables and since there's no salt or sugary ketchup, I add some cheese which makes every bite taste heavenly. Kenya had such a grin on his face when I gave him his first Cheesy Turkey Meatloaf Bite. He tried to shove the entire thing in his mouth, but luckily I cajoled him into letting me cut it up. 2. 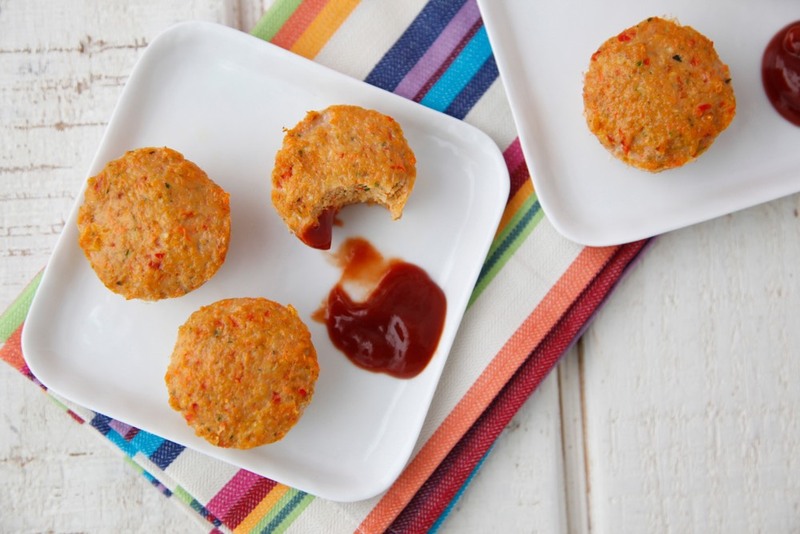 Spray a nonstick mini muffin tin with vegetable oil cooking spray or grease with oil. 3. Place the zucchini, onions, bell peppers, carrots, and garlic clove into the food processor and pulse until everything is in tiny pieces. 4. Add the egg, worchestershire sauce, herbs, bread crumbs, cheese, and turkey. Pulse until everything is combined. 5. Place about a tablespoon of the meatloaf mixture in the muffin pans and pack down with a spoon. 6. Bake until the mini turkey loaves are cooked through or an instant-read thermometer inserted in the center registers 165 degrees F, about 20 minutes. * This recipe can also be baked in a 9 x 5 inch loaf pan and baked for 50 minutes. To Freeze: After baking, let bites come to room temperature, place in a ziploc bag, label and freeze up to 3 months. When ready, defrost over night in the fridge and place in a 300 degree oven for 5 minutes to reheat. Our whole family loved these mini meatloaf bites! I am about to make them for the third time this month. It's very had to find food that my daughter likes and so when I can find something, I stick to it. I love the website and can't wait to try more recipes. I do have one question about this recipe. My mini muffin tin only holds half the recipe so we end up with 48. I was wondering if I should be using a half a pound of turkey instead of a whole pound or if I'm making the correct amount. This is the best thing I have ever eaten with ground turkey!!!!! It was so yummy! Hi Catherine, love your recipes and want to try this one too! What temp and time would this cook at for regular muffin tins? Thank you. Oh, yeah I voted! what about temp and time on a small loaf tin? I tried this today for my 11 mo old and he was not too big of a fan. I don't like meatloaf at all, and I did not think it was too bad, needed salt for me but I am an adult. My question is I had to do the veggies seperate since my food processor bit the dust last night.....could that be part of the reason they tasted kinda soggy....I had to use my magic bullet and food chopper to improvise...any thoughts? I was curious if you could eliminate the egg, as well? Is there a substitution you would recommend? You can do the 1 tbsp of ground flax seed with 3 tbsp of water solution - I have not tested it so let me know how it goes! Great recipe! I doubled the recipe and made one loaf and one min muffin recipe. I added some crushed tomatoes on top too. What a great recipe!!! Thank you!!! My husband and son will not eat veggies. I made this for them tonight and the LOVED it! They both asked for seconds. This is a great recipe! I freezed the leftovers for quick lunches and dinners. Thank you so much! Not sure if anyone has the same problem I have with cleaning the mini muffin tin (mine is a nightmare no matter how much I spray it) I have been using a mini icecream scooper and baking them on a cookie sheet, clean up problem solved! Thanks again for another awesome recipe!!!!! Brilliant idea! I also baked these in mini muffin pans with non stick spray and they came out extremely burnt on the bottom. It was a real pain to clean. I tried your idea of mini meatballs on parchment paper on a baking tray and they came out perfect and very easy to clean! Thank you! Can I use chicken instead of turkey? I used chicken the other night and it turned out great! Just wondering why you couldn't throw the turkey in with the veggies in the food processor. Great recipe! 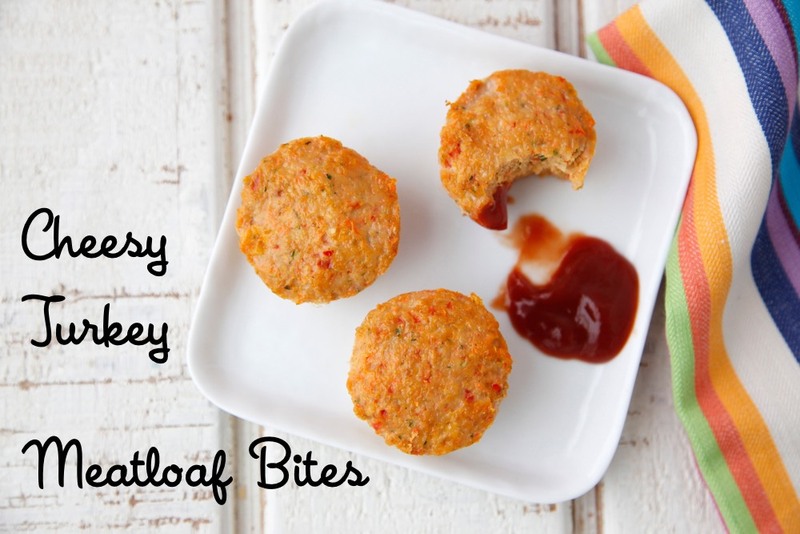 My kids love these mini meatloaves! But my 6yo insists on dipping his in Krazy Ketchup! How long and at what temp for regular muffin size muffin tins? Made these last night, big hit with my little guy! I made gluten free by substituting G.F. crackers in place of the bread crumbs. I had to blow on three hot from the oven for him to snack on before bedtime! I've been making these for my daughter since she was around 11 months old. They are a freezer staple in our house. I switch out cheeses, onion powder for fresh onion, ground chicken for turkey, yellow squash for zucchini. It all works. It's very versitle. Someone essentially lend a hand to make crailctliy articles I'd state. That is the first time I frequented your web page and up to now? I surprised with the research you made to make this particular submit amazing. Magnificent process! My 15-month old loved these! He never liked meat until this recipe. I used Trader Joe's panko and soaked it in a little milk. Otherwise kept everything the same. These were terrific and my kids loved them. We used the leftovers the next night mixed with tomato sauce over whole wheat pasta! What is in \"Italian herbs\"? Also, could I substitute bread crumbs for some quick oats? I am thinking about making this for my 1 year old. I hope she likes it! Absolutely delicious! Made it last night. I didn't have zucchini, but added 1 small stalk of celery and added pinch of Indian spices I had it on hand. Also, I added 1 tbsp of ground oats. Big hit with my kids and DH. I made this last night and it is delicious! We didnt have enough zucchini so I added in more onion and carrot. I made 6 regular size \"muffins\" and a shallow loaf, baked for 45 mins at 375. I think the loaf could have used 5-10 more minutes. My 16 month old son loved it and I thought it was awesome too. Thanks for the recipe! These are going to be a staple in my house for dinner. Bake once and you have dinner for days. Great way to get veggies into your kids. Just made this tonight for my 16 month old daughter - it's a keeper! She ate them right up! Of course I gave them a taste first, and I must say... I will be making this for the adults too! Super moist and full of flavor, as well as healthy on top of it all. Love it! Thanks for the recipe! I just do not know what to do anymore. I can not get my 3 yo to eat any meat or veggie. Now he loves muffins and cheese. Made these with ketchup on the side and he would not even try it. I eat with both my boys and eat the same thing, I cook all meals (no fast food or take out). I also do everything the books say anout feeding kids but nothing seems to work. HELP, what am I doing wrong? Hi, this looks like a great recipe! My kids have dairy allergies. Have you tried an alternative without cheese or would you have suggestions for alternatives? Thanks! I use the grater on my food processor and process/grate all the vegetables (including the onion, even though it gets pulverized) and cheese then mix with the remaining ingredients. TO SAVE CLEAN-UP TIME: I shape into little loaves on a cookie sheet lined with parchment paper. Can't wait to try these. Wondering if I packed them in my daughter's lunch box, would it taste ok cold? Our school lunches are served at room temp and the kids gobble them up! My family couldn't stop eating these! And they were so easy to make. Thank you! How well do these store for lunches? Can kids eat it cold? My kids love these in school lunch! Lunch is served at room temp! I was thinking of grinding some old fashioned oats to use instead of the breadcrumbs. You gave me this idea in your turkey burger post. Do you think it would work well here too? Yes! That should work great! I can't wait to have my family try some of your recipes! Congrats on your cookbook! My girls (3 &amp; 4) ate almost the whole batch and asked me to make them again. I put in more veggies by mistake but they still turned out great! Luckily there are a few left for their lunch boxes tomorrow. Will definitely make this again! I have two questions... 1.) How much longer do i leave it in the oven if i'm using organic beef instead of turkey? and 2)Is this recipe okay to freeze before I bake them, or do I need to bake them first and then freeze them? Also...these look fantastic and I hope mine turn out okay and my little one likes them! Thanks! hi, can i combine all of the ingredients in my blender and pulse? That might work as long as you make sure to tap it all down so that it gets evenly mixed and chopped. Otherwise you might end up with half mush and half chunky ingredients. Just made these tonight and they are absolutely delish! I like that the veggies are pureed because I have a husband who is picky about onions and he had no idea that they were even in there! Thank you! These look so yummy but how much TVP would I have to use instead of turkey ? If you cut it up like you would dice the turkey, then you should be able to use the same amount! Thank you so much for this recipe. My one year old LOVES them. I cook and bake everyday for my family and am usually pretty good at following recipes but for some reason have issues with the turkey not baking all the way and it ends up burnt. They were too mushy and still cold inside until they were too burnt to eat. Wish this recipe worked for us. We seem to need to cook any of your turkey recipes twice as long as recommended. You can leave the zucchini out. It adds moisture to the meatloaf so it will have a slightly different texture without the zucchini, but the recipe will still hold up without it.